America isn’t known for high-speed rail travel. But a new express train project taking off in Florida could shake up that perception. Brightline, owned by Florida East Coast Industries, will be the country’s first private, high-speed rail service, and will allow people to travel from Fort Lauderdale to Miami in half an hour, on trains powered by diesel electric engines. Floridians could soon get around Southeast Florida in around an hour aboard Brightline. The $3 billion project could take up to three million cars off the roads, on trains the company says were “designed with green in mind” with diesel electric engines that are quieter and spew less emissions. They’ll operate in Florida’s densest population corridor, where over six million people live and tourists continually visit. Brightline will start transporting travelers from West Palm Beach to Fort Lauderdale this month, and in early 2018 into downtown Miami. Phase 2 will take people all the way to Orlando. Much of Brightline’s marketing revolves around ease, advertising frequent departures and the ability to book on the fly. They say rideshares will be waiting at their modern stations, and while traveling people can take advantage of free WiFi. 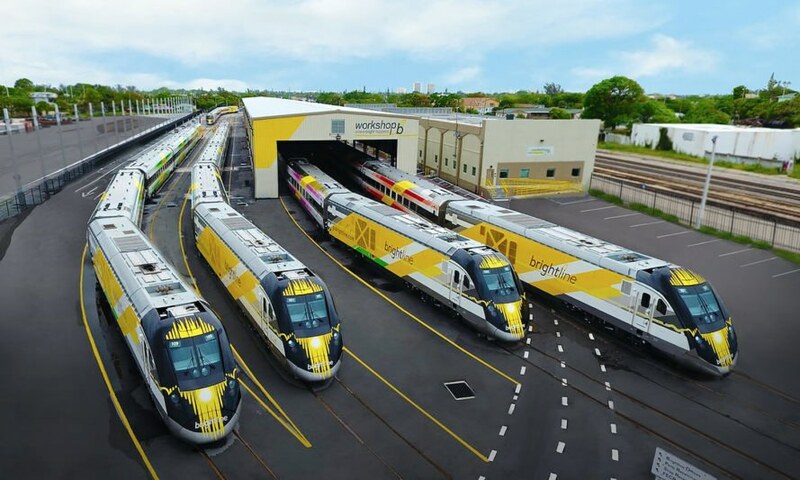 All Aboard Florida obtained state approval earlier this year to sell bonds to finance Brightline, and said no public money will go towards paying for it. The Brightline project is the first test into an American foray into high-speed rail, according to Florida Atlantic University’s Center for Urban and Environmental Solutions director John Renne. The vehicle speeds still won’t be as fast as some trains in other countries. Brightline trains will travel at 120 miles per hour (mph) at their fastest, but during the rollout they’ll operate at around 80 mph. The company has not yet confirmed ticket prices; a 2015 study they commissioned suggested it could be around $16 to go from Miami to West Palm, which is around $10 more than the price to journey on a government-run train on a similar route. i wish journalist knew what high speed rail is. Considering it takes about 25 minutes to DRIVE from Ft. Lauderdale to Miami in a car, on I-95, with some traffic, I wouldn't exactly call this "high-speed". A private, high-speed train service is launching soon in Florida. People will be able to travel between Fort Lauderdale and Miami in half an hour on the trains. The Brightline trains have diesel electric engines.